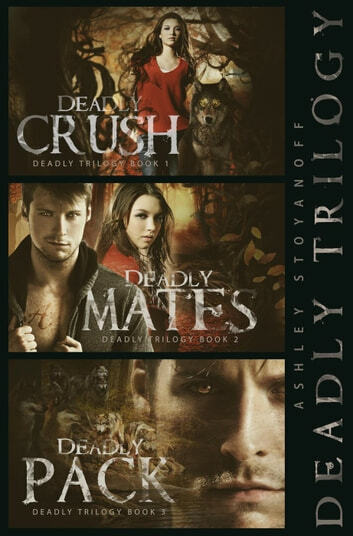 Get the entire Deadly Trilogy in this eBook collection from award winning author, Ashley Stoyanoff! Jade Shaw has spent the last two years avoiding the pack. But when Aidan Collins moves to town, avoiding the dogs doesn’t seem possible. The pack wants him just as much as she does. Determined to keep him out of the pack’s grasp, Jade does everything she can to gain his attention. Little does she know, Aidan is in deeper with the pack than she could have imagined, and competing for his attention is a deadly game, one she may not want to win. Jade never thought she’d embrace being a werewolf, but after having accepted her new role as alpha female of Dog Mountain’s pack, she finds herself doing just that. She’s training with the enforcers and learning to use the alpha within her to her advantage. And for the most part, Jade is content, well at least with her training she is. But Dog Mountain is a small town with big problems. The new alpha pair is divided, splitting the already unstable pack with them, and to make matters worse, Jade’s father is on his way home. Except Jade’s father and his twisted pack of werecourgars aren’t the only threat. When Aidan brings in a new set of enforcers to weed out the problems within the pack, Jade is forced to delve into the center of the issue. She soon realizes that she is the indirect cause of the uneasiness within the pack, and if Jade doesn’t fix it, she’ll lose everything, even Aidan. Since becoming the alpha female of the Dog Mountain pack, Jade certainly has had her share of challenges. She’s had to prove herself to a bunch of werewolves that she spent years hating; forgive her mate who’d done nothing but lie to her, and face the grueling fact that her father leads a pack of werecougars, who are responsible for tormenting her werewolves for many years. On the upside, the Dog Mountain pack is finally coming together—now that Jade and Aidan’s mate status is official. And now that they know where her father’s been hiding his nasty pack of beasts, Jade and Aidan can concentrate on stopping them once and for all. But when Jade’s dad finds out that she’s become Aidan’s official mate, all hell breaks loose, and Jade and Aidan soon learn that his plans for their werewolves are bigger than anyone could have ever suspected. Deadly Trilogy is about Jade and Aidan who live in a town where werewolves live openly. Jade doesn’t like the pack or anything about it. She has a strong personality and will not back down from anything which means she is always annoying someone – usually someone from the pack. Aidan, the Alpha of the pack, is assertive, extremely good-looking, and attracted to Jade. Jade doesn’t know he is the Alpha and Aidan doesn’t know how much Jade hates the pack. This leads to some pretty interesting situations for them. The character development in this series is quite in depth. I felt a connection with the characters because they were so well developed in this trilogy. I like the way Stoyanoff put her own distinctive slant to the werewolf legends. This series is very well written making it easy to picture all the events taking place. I liked the way Jade and Aidan's inner wolf was addressed as if it was a separate being. The author brought some romance into it which I enjoyed. It didn't overpower the story but it was nice to see that there was some feelings between Aidan and Jade, not just pack business. This was a great series that I really liked and highly recommend. I really enjoyed this trilogy. I think one night I read solidly till 3am-I just could not put it down. I enjoyed her narration style from the main characters perspectives- you find yourself connecting with them.